Several years ago, when Sujeet Desai visited the city, he performed exclusively for children with Down syndrome. The children were thrilled and the parents at the programme told me that there was hope, even for their children. Sujeet’s mother told the audience how her son, who had Down syndrome, had discovered a new world, was independent and travelled around the globe for music performances. Sujeet spoke to the children and remained the star attraction on that day. Last week, the Down Syndrome Association of Tamil Nadu organised a day-long workshop for 30 government school teachers, who were exposed to training methods of therapists from the United Kingdom. D. Sabitha, principal secretary of school education, inaugurated the workshop, and told the teachers that they would in turn, train their peers and colleagues. The aim is to address the needs of children in mainstream government schools, and those in residential centres. Chronologically, the child could be a teenager, but may have the IQ of a pre-teen, explained Julie Hughes. Children with Down syndrome must be taught using visual cues, given their low attention span and their problems with hearing. Children often hear only the last syllables of a word and they have difficulty in retaining sound patterns in their memory. Suppose you have to teach the child the word ‘ball’. It would be better to use the word repeatedly in as many sentences as you can. So if you are too quick with the words, the child does not understand it. Children with Down syndrome are at a higher risk for ear infections and hence have difficulty in hearing, ENT surgeon Mohan Kameswaran says. This leads to speech delays and unlike children without the condition, they are unable to understand verbal cues. “Hearing impairments and octological problems are found in 38 to 78 per cent of children with Down syndrome, compared to 2.5 per cent of other normal children. Such children must undergo audiological screenings at birth, and then every six months for three years,” Dr. Mohan said. However, appropriate evaluation and treatment can have a significant impact on the quality of life of children with Down syndrome, he added. 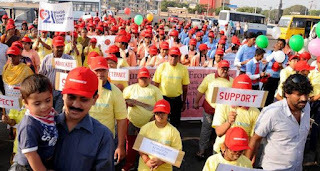 Down syndrome is a genetic disorder that affects one in 750 children in India, said Rekha Ramachandran of Down Syndrome Association of Tamil Nadu. The only way to ensure that such children are mainstreamed in schools is by training enough resource persons, she added. When I asked her about Sujeet and his extraordinary achievement, she said independence comes with confidence in communication. In India we are still taking the first tentative steps towards teaching our children with Down syndrome to communicate. When this is achieved, we will have many Sujeets.